VANCOUVER, BC, August 12, 2009 — Mirasol Resources Ltd. (TSX-V: MRZ, Frankfurt: M8R) is pleased to announce the start of a 1,600 metre drilling program by its joint venture partner, Coeur d’Alene Mines (“Coeur”), at its 100% owned Nico silver gold project located in the prolifically mineralized Province of Santa Cruz in southern Argentina. 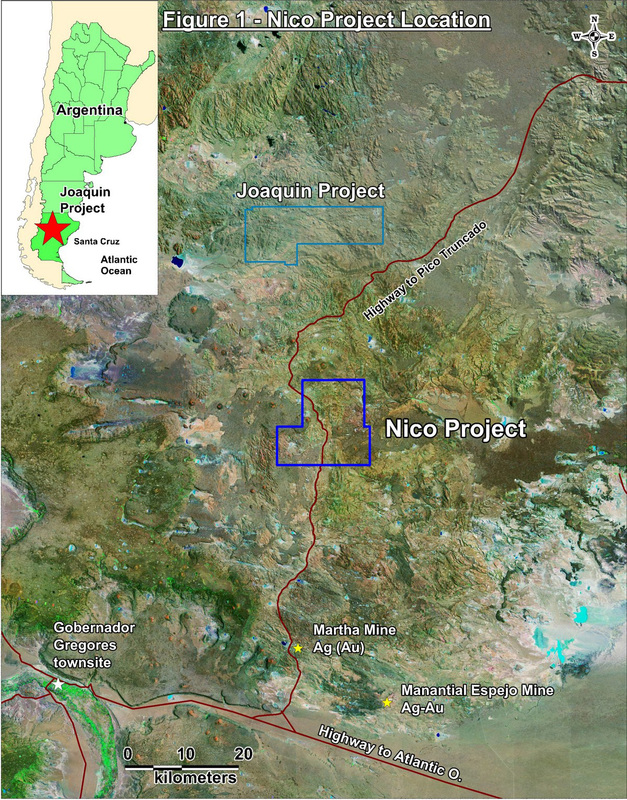 The Nico project is strategically located adjacent to a provincial highway some 40 kilometres to the north of Coeur’s high grade Martha silver mine and in the same area as Mirasol’s new silver discovery at the Joaquin project (Figure 1). This program represents the first drilling test at Nico. Drilling of fourteen holes totalling approximately 1,600 metres is proposed to test a series of outcropping silver and gold geochemical anomalies and covered geophysical targets at the Tito Vein zone and the Carlos Breccia (see press release of May 27, 2008). At the Tito Vein zone, three trends of sub meter wide breccias and epithermal veins have returned precious metal assays from chip samples up to 324 g/t silver and 8.6 g/t gold. Gradient array IP geophysical studies outline a series of resistive and chargeable anomalies, which underlie the Tito Vein trend, suggesting the potential for larger bodies of mineralization at depth. The Carlos Breccia is a zone over 500 metres long by up to 50 metres wide comprising crackle-brecciated volcanic rocks with low temperature silica-hematite matrix. Breccia samples returned consistently anomalous silver, gold and base metal assays, with seven samples containing over 10 g/t silver and strongly elevated epithermal pathfinder elements. The Carlos Breccia is underlain by a 1,200 by 800 metre zone of strongly chargeable induced polarization (IP) geophysical anomalies that may represent concealed sulphide-rich material which carry grades of silver, gold and base metals. Ongoing exploration at the Nico project is 100% funded by Mirasol’s joint venture partner, Coeur d’Alene Mines Corporation (Coeur). The terms of the agreement (see press release of February 12, 2009) provide that Coeur spend US $2.3 million in exploration and cash payments over four years to earn a 55% interest in the property, and a 65% interest on completion of a bankable feasibility study, at which time Mirasol may elect to maintain a 35% participation. Coeur may acquire a 75% interest by providing project development financing at commercial terms to Mirasol, repayable from production cash flow. Coeur is exploring the Nico project for stand-alone resources and / or high-grade ore for the nearby high grade Martha silver mine. Mirasol Resources is pleased to be evaluating this project with Coeur d’Alene, who brings to the joint venture significant experience in the exploration and development of epithermal precious metal mineralization in the region. Stephen C. Nano, Vice President of Exploration for Mirasol, is the Qualified Person under NI 43-101 who has verified and approved the technical content of this news release. Quality Assurance/Quality Control: Coeur d’Alene operates the Nico Project. Geochemical samples from Mirasol’s exploration phases were submitted to Alex Stewart (Assayers), Argentina S.A. in Mendoza, Argentina. Gold and silver results were determined using standard fire assay techniques on a 50-gram sample with an atomic absorption finish for gold and a gravimetric finish for silver. All assay results reported herein are for rock samples; assay results from drill core samples may be higher, lower or similar to results obtained from surface samples.